The baby boomer generation is on track to have more years in retirement than ever before. Find out what's trending as the top living expenses to be better prepared for lifetime income needs. More and more baby boomers are entering the retirement phase of their lives each year and sufficient income for retirement expenses is needed to sustain the lifestyle they worked hard to achieve. A lot has changed since they entered the workforce, including a person’s longevity. In 1940, the life expectancy of a 65-year-old was almost 14 years; today it is just over 20 years.1^ "Social Security Basic Facts," Social Security Administration, 2018Since the baby boom generation will spend more years in retirement than previous generations, they will have to save more money during their working years to be able to enjoy the same level of comfort throughout retirement as during their professional lives. Housing leads the retirement expense list, costing retirees approximately 34 percent of their average annual spending.2^Based on responses from participants age 65 and older in a 2017 nationwide survey: "Consumer Expenditures Survey," U.S. Bureau of Labor Statistics, 2018For retired baby boomers, one housing trend that has emerged is the senior rental market. Between 2009 and 2015, the number of renters over age 55 increased 28 percent.3^“The Biggest Game Changers in Renting are Older, Highly-Educated Renters, and 2.5 Million Stronger,” U.S. Census Bureau Data, 2017/ RentCafe® Blog, 2017 Many retirees want to “age in place” with the numerous convenience, lifestyle and activity options urban living offers. 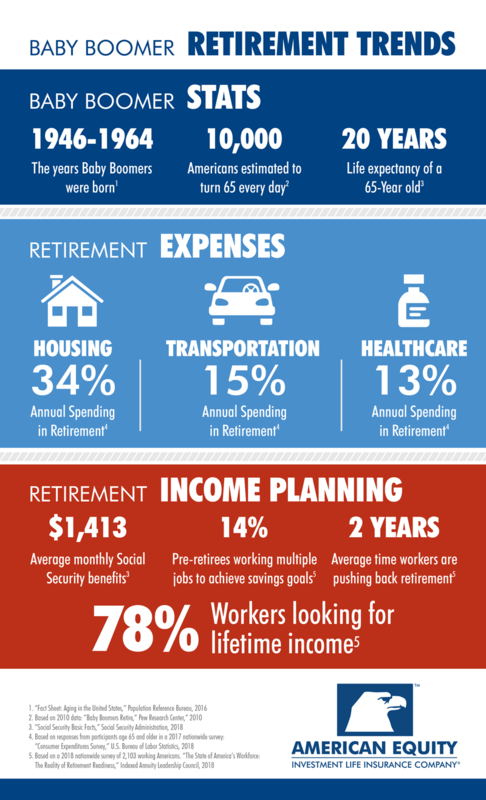 We take a closer look at these top retirement trends and other notable baby boomer statistics in the infographic below. With these various expenses expected throughout retirement, baby boomers looking for the assurance of reliable retirement income sources and long-term retirement products have several options to create a balanced portfolio, including Social Security benefits, pensions, 401(k)s , annuities and various other retirement products. While retirement needs vary by the individual, benefits provided by many retirement products such as principal protection, tax-deferred growth and lifetime income can help provide the financial security and stability that is essential during retirement. A retirement plan that includes reliable income sources can help ease fears about outliving income in retirement so boomers can continue to do what they have always done – get busy living. Dig deeper into housing retirement trends as well as transportation and health care innovations in our retirement trends series.